The modern exterior hides a sensitive restoration of the old station building/hotel inside. Usual range of Fullers beers, Pride in reasonable condition. First pub of the day visiting where we lived in the 80''s. Probably the best station pub in London at the moment. Good range of Fullers beers with a few guests. Probably not the place to spend an evening, but a nice place to call into for a pint en route to elsewhere. Fancying a drink after the train back to London, I initially tried the Cider Tap (soon to close) at Euston only to find they had stopped serving by 9pm (very strange for a weekend). So I grabbed the opportunity to have a swift half at the Mad Bishop & Bear. This is a Fullers pub, generally with a guest ale or two. 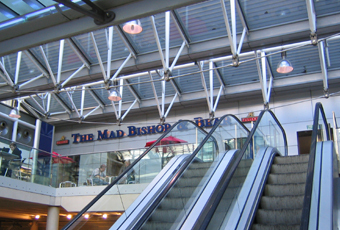 It is situated in the retail development up a couple of escalators. But it is still fairly busy. Departure screens ensure you don't miss your train or you can at least check what time the next one is, if you do happen to stay for one too many. On my visit, they had Fullers London Pride, ESB & Olivers Island, Gales Seafarers & Redwood, St Austell Tribute & Tomos Watkins The Last Inch. I went for the Redwood, which I wasn't too keen on. Still a handy place to know about and certainly the best of the 2 pubs at Paddington station. I've just noticed that they offer a CAMRA discount too. Fullers pub co outlet in Paddington station. Not somewhere I'd venture to again in the future unless there are no other options. 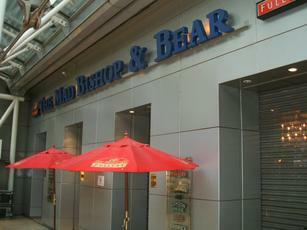 Chain pub feel, medicore beer, indifferent service, through other feel to the place. Spacious and adquate bar high up in Paddington station. A fair range of ales, including several guests, and a place that seems less frenetic than its Fullers counterpart at Kings Cross. Couldn't understand why the sign to the Gents is in LMS maroon, here at the very fundament of all things Great Western, but with a decent pint to hand, I didn't lose too much sleep over it.